WITS had the great pleasure of working with Miriam Sitz this summer. She was the recipient of an internship with WITS through the ExxonMobil Community Summer Jobs Program. ExxonMobil began this project as a way to provide real world experience to college students in a variety of fields. The ExxonMobil Community Summer Jobs Program is designed to match college students with organizations that fit with the student’s professional ambitions. In Miriam’s case, her area of interest was curriculum development and intermediate language education which made her a perfect candidate to work with WITS during the Summer Creative Writing Workshops. 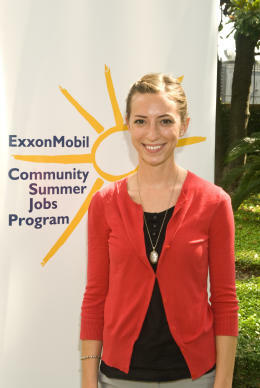 Click here to read the Houston Chronicle story about the ExxonMobil Community Summer Jobs Program. Click here to find out more about WITS interships.